Source: Modification from here & there.. 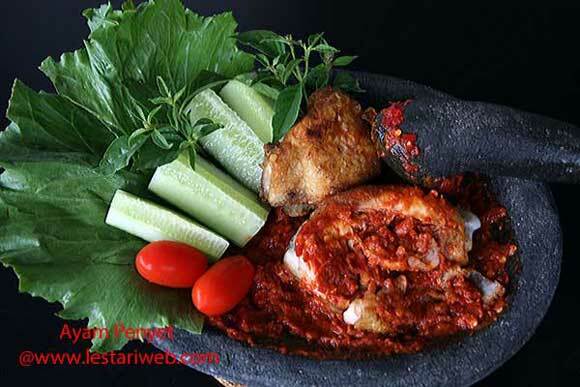 This is a famous traditional street dish in Malang City, East Java Province. One of my favorite menus in Warung Arema, Pujasera, Batam island besides Tempe Penyet, Tahu Telur dan Nasi Rames. I've had it often together with my ex colleagues as our delicated lunch in the middle of our busy days. Fried Fried Chicken: Cut the chicken breast in 2 or three part. Put on a sauce pan. Grind garlic, turmeric, coriander & salt with stone mortar & pestle into smooth paste. Transfer the paste into the pan. Add 250 ml water & stir to mix. ( If you use blender instead mortar, add litlle bit water from 250 ml water to help the blending process). 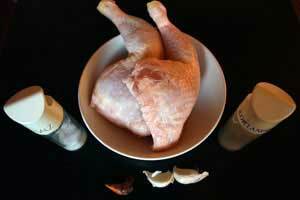 Boil the chicken over medium heat until the chicken well cooked & the liquid is almost driven off. Put aside. Adjust the marinating liquid, add more sat if necessary. Put aside. 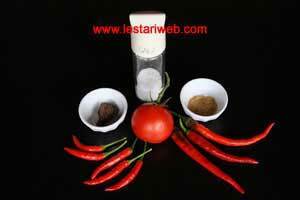 Making Sambal Terasi Penyet: Put the large & bird chillies in a mortar / grinding stone and grind until smooth. (Don't use blender, otherwise you'll ruin the taste. One time-consumed sambal is to be made traditionally to get the best-authentic taste). Add the chopped tomato and roasted shrimp paste , grind them again. Stir to mix. Adjust the seasoning, add the salt & sugar to taste. Fried Chicken : Heat 250 ml or enough oil. Rub the chicken with the left-over marinating paste then deep-fry the chicken until crispy goldbrown. Set aside to drain. Serving method : Put the fried chicken on top of the sambal terasi. Bruised / crush the tempe slightly with the pestle. Serve with rice & condiments. If preferred you can replace sambal terasi with Lesser Galangal Sambal. Be carefull by adding shrimp paste, some of sort is already being salted so adding of salt into sambal sometimes is not necessary.